Wyeth, Jim and Penny Coulter with George H. Morris, Saer Coulter and Ronnie Beard at the Maxine Beard Award Presentation. Photo By: V. Valenti – The Book LLC. Tampa, FL – April 7, 2013 – The United States Equestrian Team Foundation is pleased to announce that 21-year-old Saer Coulter of San Francisco, CA, has been selected as the 2013 recipient of the Maxine Beard Show Jumping Rider Award. Coulter was presented with the Maxine Beard Award trophy at the American Invitational on April 6, 2013, at the Raymond James Stadium in Tampa, FL. The selection was based on Coulter’s competitive record and potential to represent the United States in international competition. In 2012, Coulter advanced to the highest levels of the sport, competing in the 2012 Olympic Selection Trials and also in multiple World Cup Qualifiers and Global Champions Tour events. The award provides Coulter the opportunity to be credentialed and travel with the U.S. delegation to the 2013 FEI World Cup Finals in Gothenburg, Sweden, from April 24 – April 28. She will observe the operations of an international championship, including the stabling area, veterinary inspections and schooling, and will walk the courses with the U.S. Show Jumping Coach, Robert Ridland. Coulter’s international success began in 2010 when she and Chalan were on the team that represented the United States bringing home a victory at the CSIO Buenos Aires in Argentina. In 2011, Coulter placed second in the $50,000 HITS World Cup Qualifier in California aboard her Dutch Warmblood gelding, Springtime, and also placed second in the $40,000 Blenheim Spring Classic II Grand Prix. After finishing 10th in the Olympic Selection Trials and being named to the USEF Long List for the U.S. Show Jumping Team for the London 2012 Olympic Games, Coulter and Springtime finished third in the $100,000 Hermes Grand Prix of Del Mar. Throughout the summer she traveled to Europe to compete in the Global Champions Tour (GCT). The Stanford University senior rides out of her family’s Copernicus Stables, while training with Markus and Meredith Michaels Beerbaum. Coulter recently added new mounts to her string including Don V.H.P. Z, Carmena Z and Graciella 50. “Saer is a talented and hardworking rider who truly deserves this honor as she was a top placer in the World Cup West Coast League, just narrowly missing out on competing herself at the Championship this year. I fully expect we will see Saer on more United States teams and at international championships. She has a very bright future in this sport”, commented George H. Morris. With the talent, drive, and determination to be a top-notch competitor, Coulter has proven that she will be a part of the future for show jumping in the United States. 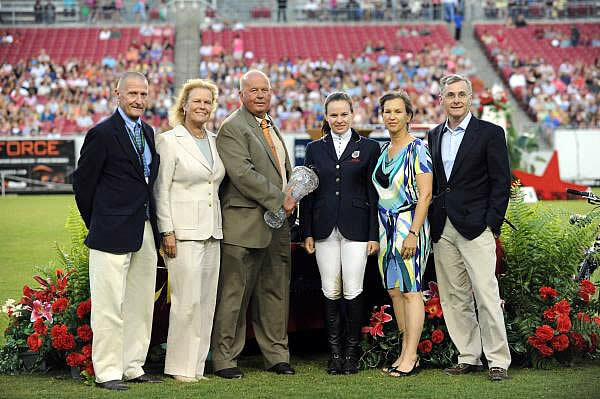 Gladstone, NJ – April 9, 2012 – The United States Equestrian Team Foundation is pleased to announce that Katie Dinan of New York, NY, has been selected as the 2012 recipient of the Maxine Beard Show Jumping Rider Award. Dinan received the Maxine Beard Award trophy at the American Invitational on April 7, 2012, at the Raymond James Stadium in Tampa, FL. The selection was based on Dinan’s competitive record and future potential to represent the United States in international competition. The award provides Dinan the opportunity to be credentialed and travel with the U.S. delegation to the 2012 FEI World Cup Finals in ‘s-Hertogenbosch in the Netherlands, from April 19 – April 22. She will observe the operations of an international championship, including the stabling area, veterinary inspections and schooling, and will walk the courses with the U.S. Show Jumping Coach, George H. Morris. At just 18 years old, Dinan is already taking the grand prix circuit by storm looking like she will be at the top of the sport in no time. After winning the 2011 Individual Gold medal at the North American Junior Young Rider Championships aboard Vancouver last year, Dinan established herself at the grand prix level at the beginning of 2012. She proved that consistency is key, and with continued top placing at the biggest events at the Winter Equestrian Festival, she eventually took home the blue ribbon in the $50,000 Horseware Ireland Grand Prix with Nougat du Vallet. 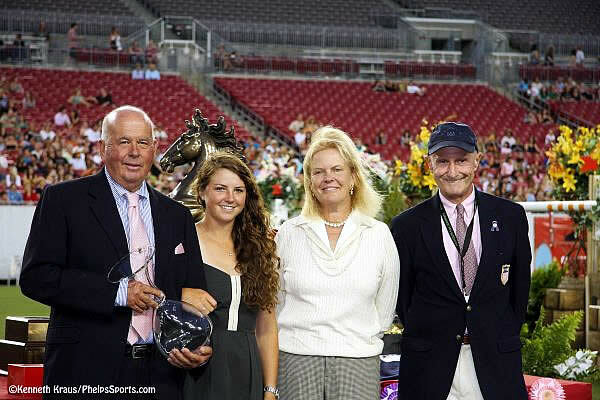 Ronnie Beard, Ali Wolff, Jane Clark and George H. Morris for the Maxine Beard Award Presentation at the 2011 $200,000 Gene Mische American Invitational. Photo By: Kenneth Kraus/ PhelpsSports.com. Gladstone, NJ – April 12, 2011 – The United States Equestrian Team Foundation is pleased to announce that Ali Wolff of New Albany, OH, has been selected as the 2011 recipient of the Maxine Beard Show Jumping Rider Award. Wolff received the Maxine Beard Award trophy at the American Invitational on April 9, 2011, at the Raymond James Stadium in Tampa, FL. The selection was based on Wolff’s competitive record and future potential to represent the United States in international competition. The award provides Wolff the opportunity to be credentialed and travel with the U.S. delegation to the 2011 FEI World Cup Finals in Leipzig, Germany, from April 27 – May 1. She will observe the operations of an international championship, including the stabling area, veterinary inspections and schooling, and will walk the courses with the U.S. Show Jumping Coach, George H. Morris. At the young age of 21, Ali Wolff has already accomplished a great deal as an up-and-coming equestrian. Her biggest win came in 2010 when she won the Individual Gold medal at the North American Junior Young Rider Championships. After holding the 23rd position she quickly climbed the ranks throughout the competition, eventually capturing the top prize.